David Beckham is one of Britain's most iconic athletes whose name is also an elite global advertising brand. 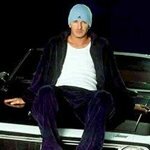 He was captain of the English national team from 2000 to 2006, scored in three different FIFA World Cups, and played midfield for clubs in Manchester, England and Madrid, Spain, before agreeing to move to Los Angeles, to play for Los Angeles Galaxy team on a five year contract beginning on July 1, 2007. He was born David Robert Joseph Beckham on May 2, 1975, in Leytonstone, East London, England, son of Ted Beckham, a kitchen fitter, and Sandra West, a hairdresser. 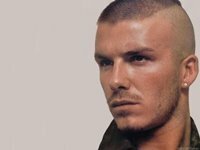 Beckham's maternal grandfather is Jewish, and he has been mentioning the religion as influence; he wears a tattoo written in Hebrew from the 'Song of Songs' in the Hebrew Bible (Old Testament), albeit he is not known to practice Judaism or any other faith. 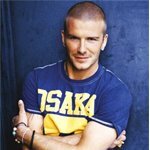 Beckham has always played in long sleeve shirts to cover up his tattoos in consideration of others who may feel uncomfortable due to their beliefs. He was brought up by his parents, supporters of Manchester United, attended Bobby Charlton's football school in Manchester, and won a spot in a training session at FC Barcelona as a child. In 1986 he was a Manchester United's mascot for a match against West Ham United. From 1992 - 2003 Beckham made almost 400 appearances for Manchester United and scored 85 goals, although his official record counts only 62 goals in 265 official senior team's matches. In the 1998 FIFA World Cup he played all of England's qualifying matches and scored in several important victories. He received a red card for violent conduct in England's match against Argentina, albeit his opponent later admitted to trying to send Beckham off by over-reacting to their contact during the game and by urging the referee to send Beckham off. After losing the game England was eliminated, Beckham was made a scapegoat and became the target of criticism and abuse in media. He had a good season in 1999 - 2000 and helped Manchester United to win the Premier League. At that time he married singer Victoria Beckham from the popular group Spice Girls, and the couple had their first son, Brooklyn, born in 1999. That same year Beckham was given a permission to miss training routine, in order to look after his son Brooklyn, who suffered from a stomach infection. Meanwhile, the Manchester United's manager, Alex Ferguson, fined Beckham £50,000 (about $80,000 then) the maximum amount that was permitted, for babysitting with his sick child, while his wife was spotted at a London fashion Week event on the same night. Ferguson's claim that Beckham should be able to train if his wife stayed home that day, caused a serious personal tension between two men. In February 2003, following the defeat to Arsenal, the Manchester United's manager Alex Ferguson entered the changing room and kicked a football boot that struck Beckham over the eye, causing a cut that required stitches. David Beckham has been a good scorer and a major attraction for public. On the field he has been demonstrating his consistent ability to see a big picture even under severe pressure during the most rapidly changing and unpredictable games. His field vision has been remarkable, allowing him to create many assists in a number of important matches. Beckham's forte has been his delivery from the right-hand side as well as his efficient free kicks. His superior performances in the midfield position has required a higher physical endurance through the entire game. "David Beckham's right foot" was mentioned, although humorously, as one of British national treasures in the movie Love Actually (2003). He signed a four-year contract with Real Madrid, beginning on July 1, 2003, and worth a potential 40 million dollars. In Madrid, Beckham was not allowed to wear his favorite number seven, because another player had the right to wear it written into his contract. Beckham decided to wear the number 23 instead, being a big fan of Michael Jordan. He immediately became popular with the Real Madrid fans, but the team did not perform well enough to win either the Spanish League or the Champions League. However, Beckham remained a reliable scorer and his performances attracted more public. His shirts sales and other merchandising deals remained lucrative for the club, which continued to under-perform, regardless of the Real's management's higher expectations. In 2005 Beckham became a UNICEF Goodwill Ambassador. He was also involved in promoting London's successful bid for the 2012 Olympic Games. His third season in Madrid was unremarkable, and he was criticized a lot, mainly because the team finished second to Barcelona in Spanish "La Liga" and lost to Arsenal in the European Champions League. However, during that season, he expanded his international presence by establishing football academies in Los Angeles and East London. During the FIFA World Cup 2006, he played for England, and became the first ever English player to score in three World Cups. In the quarter final game against Portugal, Beckham was replaced because of his injury in the middle of the game. Without him the English team lost and was knocked out of the World Cup. In February 2007 he played his last game for Real Madrid in his fourth, and last season there, ending his contract with the club in the spring of 2007. He announced that he had signed a five-year contract to play for the Los Angeles Galaxy from July 1, 2007 through June 2012. 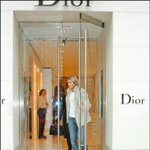 The 5-year deal includes up to $10 million a year in direct salary, and with merchandising endorsements and profit-sharing could earn Beckham up to $50 million a year, and may end up worth about $250 million in five years, making him one of the highest earning athletes of all time. The Beckhams, who have become known as "Posh and Becks", have three sons: Brooklyn Joseph Beckham (born 1999), Romeo James Beckham (born 2002), and Cruz David Beckham (born 2005) who was named "Cruz" in honor of their friend Tom Cruise.